During the total solar eclipse on Aug. 21, ASU’s Lunar Reconnaissance Orbiter Camera (LROC) captured an image of the moon’s shadow over a large region of the United States, centered just north of Nashville, Tennessee. LROC is a system of three cameras mounted on the Lunar Reconnaissance Orbiter spacecraft (LRO). Two Narrow Angle Cameras (NACs) capture high-resolution black-and-white images. A third Wide Angle Camera captures moderate-resolution images using filters to provide information about the properties and color of the lunar surface. As LRO crossed the lunar south pole heading north at 3,579 mph (1,600 meters per second), the shadow of the moon was racing across the United States at 1,500 mph (670 meters per second). A few minutes later, LRO began a slow 180-degree turn to look back at Earth, capturing an image of the eclipse very near the location where totality lasted the longest. The spacecraft’s NAC began scanning Earth at 2:25:30 p.m. EDT (18:25:30 UTC) and completed the image 18 seconds later. “Planning the image required close cooperation between the LROC team at ASU and the LRO Missions Operations Center at Goddard Space Flight Center,” said Mark Robinson, principal investigator of LROC at ASU’s School of Earth and Space Exploration. The NAC builds up an image line by line rather than the more typical “instantaneous” framing that occurs with digital or cellphone cameras. Each line of the image is exposed for less than one-thousandth of a second; the exposure time was set as low as possible to prevent bright clouds from saturating the sensor. It takes about 18 seconds to acquire all 52,224 lines for the image. 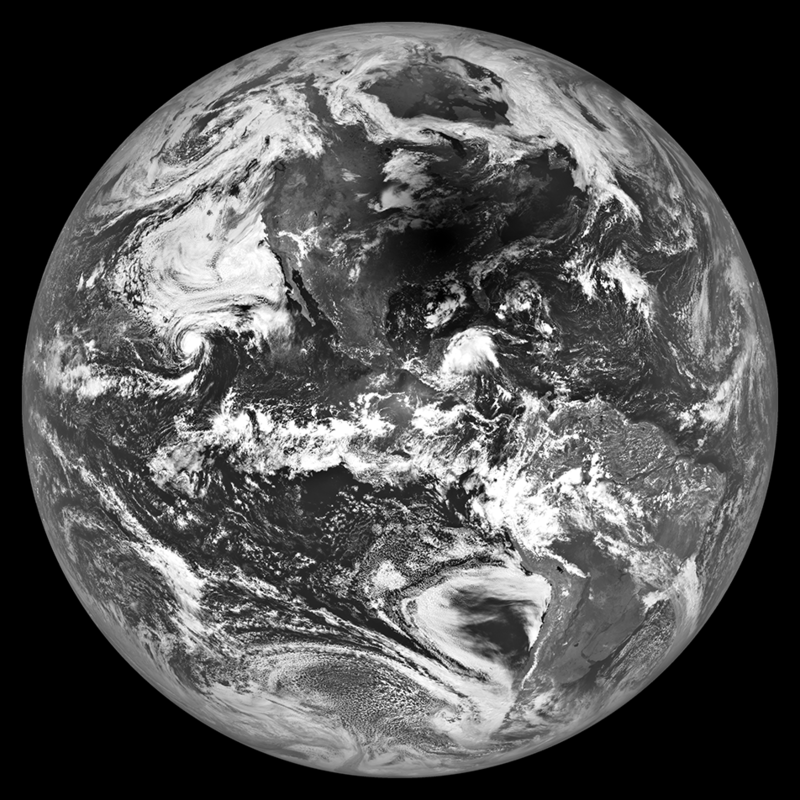 This sequence shows a black-and-white image of the moon’s shadow on Earth, as seen by NASA’s Lunar Reconnaissance Orbiter. The levels of gray in the image are gradually adjusted, saturating the background until the features of the landscape disappear. At that point, it’s possible to see the edge of the total solar eclipse. As the gray levels are restored, the umbra (completely shadowed area) becomes visible, followed by the penumbra (partial shadow) where part of the sun peaks over the edge of the moon. While the thrill of the total eclipse was in experiencing the shadow of the moon sweep across us on Earth, on the moon this was just another day. The lunar nearside was one week into its two-week night, while the sun shone on the far side in the middle of its two-week day. Because solar eclipses do not affect the health or power supply of the spacecraft, LRO operated normally during the total solar eclipse. Launched on June 18, 2009, LRO has collected a treasure trove of data with its seven powerful instruments, making an invaluable contribution to our knowledge about the moon and reminding us, through these eclipse images, of the beauty of our Earth. LRO is managed by NASA's Goddard Space Flight Center in Greenbelt, Maryland, as a project under NASA's Discovery Program. The Discovery Program is managed by NASA's Marshall Space Flight Center in Huntsville, Alabama, for the Science Mission Directorate at NASA Headquarters in Washington. The Lunar Reconnaissance Orbiter Camera was developed at Malin Space Science Systems in San Diego and at Arizona State University. Read more about the solar eclipse imagery at the LROC site, http://lroc.sese.asu.edu/posts/980.